If Marijuana is Medicine, How Come it Makes People So Sick? There’s a great irony that comes from the pot industry’s claims that marijuana is medical and it’s supposed to help with nausea. It’s called Cannabis Hyperemesis, and it hits with a vengeance. Incidences of this severe illness appear to be on the rise since the rollout of legal weed. The high THC content of today’s weed — 5x the amount in the 1980s — seems to be involved also. Because of misdiagnosis or denial of drug use by patients, this syndrome is going undetected. Furthermore, users self-medicate and exacerbate this severe illness, as a medical marijuana patient was doing for more than eight months. From veterans hospitals to addiction specialists as well as gastroenterologists, there’s suddenly an increased interest in and diagnoses of this condition. Further research into this mysterious illness turns up numerous medical journal articles on the link between excessive and/or long-term cannabis use and hyperemesis. This syndrome is still largely unknown throughout the medical profession and even among cannabis users. The most prominent cases are among long-term users that started using the drug at a very early age and have used daily for over 10 years, according to the MedScape article, Emerging Role of Chronic Cannabis Use and Hyperemesis Syndrome. The article goes on to say that it can also effect newer users and even non-daily users. In Practical Gastroenterology, there’s a case of a 19 year old Hispanic man who contracted the problem within only two years of marijuana use. Symptoms reported in a Current Psychiatry article include cyclic vomiting, abdominal pain, nausea, gastric pain and compulsive hot bathing or showers to ease pain. Frequent bathing and vomiting can also lead to dehydration and excessive thirst. Mild fever, weight loss, and a drop in blood pressure upon standing are other symptoms. Sufferers find they need to take many showers or baths a day just to get relief from the chronic nausea and vomiting. The bouts of illness are so severe and frightening they lead to frequent trips to the emergency room. And finally, this debilitating illness can be very disruptive to life and relationships. The many absences from work lead to job loss and the inability to hold down a job. Parents may mistake this situation as bulimia, particularly if the teens hide the vomiting. Another common way this disease is misdiagnosed as cyclic vomiting syndrome. According to the Current Psychiatry article, 50% of those diagnosed with CVS are daily cannabis users. Another common misreading by doctors of the compulsive habit of frequent hot baths is as Obsessive Compulsive Disorder. 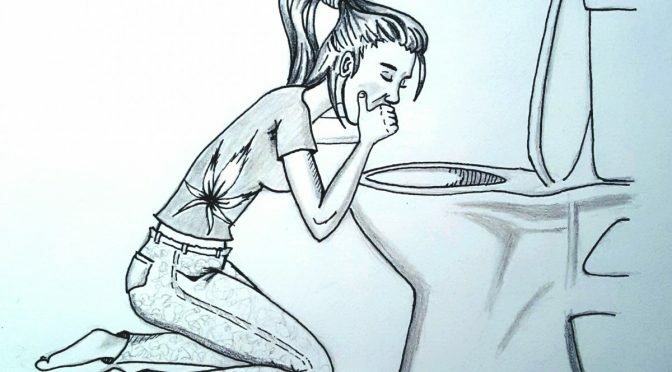 Further complicating matters, doctors find that even when cannabis use is consistent, the bouts of hyperemesis come and go, which further serves to keep the patient in denial about the connection to their drug use. Complete cessation of marijuana use is the only known cure for Cannabis Hyperemesis Syndrome. Sadly, even those who have greatly suffered over a long period of time, still want to be able to consume marijuana. The claim by the industry that marijuana is not addictive is easily disproved when you see the comments to a High Times article, What is Cannabinoid Hyperemesis Syndrome? Not only do many commenters admit they suffer from this detrimental effect of this drug, they confess they still love marijuana. The commenters lament having to give up their stoner lifestyle even after years of disabling illness! A number of them state that once they are well, they plan to return to the habit, albeit to a lesser degree.